Elemental ~ Jewelry With Substance: Welcome to ELEMENTAL JEWELRY!! 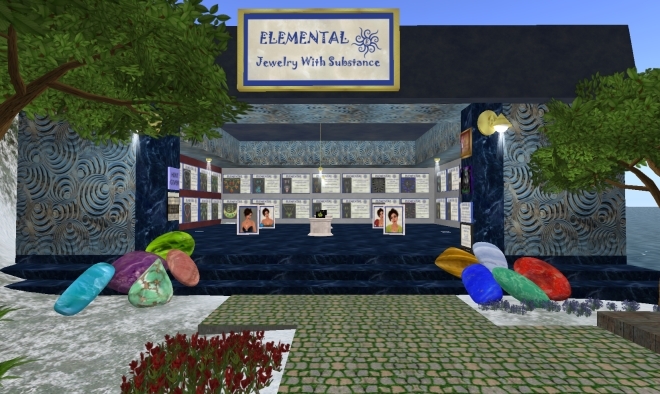 As you can see in my "about me" section, I have been making SL jewelry for some time and selling it at my first shop, METAPHYSICAL MERCANTILE--where I also sell furniture, lighting, and other decor items. However, jewelry-making is my area of special interest, both in RL & SL. So...I now have ELEMENTAL JEWELRY. Most of my jewelry is modeled after RL designs with some SL liberties, and I tend to use colorful, semi-precious stones. You won't find "bling" at Elemental Jewelry, but you will find shiny, glistening pieces. There are very delicate, intricate items, as well as chunkier designs. My jewelry is quite versatile and can be worn with a variety of styles. In this blog, I will be showcasing my jewelry as well as providing updates on new items, sales, events, hunts, and exclusive group member gifts, etc. Also, I hope you will clearly notice that my jewelry is evolving. I am learning more and more about making textures, sculpting, and building. My goal is to continue to learn and improve the quality of the jewelry I have to offer the SL community.